I have been clicking into every review I can find on the October box for the past few days. I was super excited about Inika being in the box. After reviewing a few variations, I told myself that I would be content with whichever variation I receive, they all looked so good!! I was thrilled to see my box at the doorstep when I came home! The new box design is gorgeous, I think I like it better because the other boxes kinda fell apart as soon as they arrived. This shampoo is formulated with nettle extract. My hair gets a bit greasy after a day or two post wash, so this will come in handy! 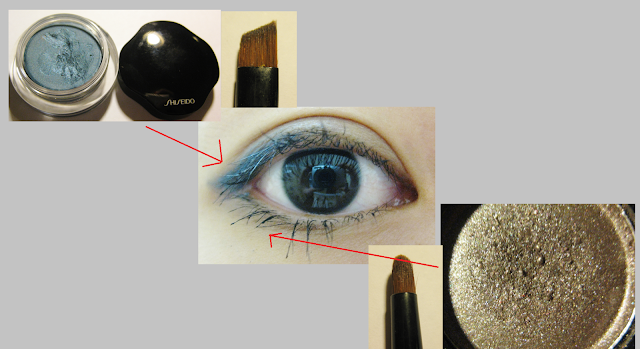 A pretty decent sample, according to the product card, this blush is highly pigmented. The other alternative was eyeshadow, I am really happy I got the blush because I'm blush crazy! This is from their earth sourced collection, the moisturiser is light and rich in antioxidant. Woohoo! I use a LOT of moisturiser! Also ideal for babies. The other alternatives were toner and cleansing gel. I'm not sure how many sheets i received, looks about 15-20. Another product I would definitely use, I carry blotting paper around during summer and when I am in an air conditioned environment - even though i have dry skin, I tend to get a little oily in the T-zone within the specified environment. This is probably the only product I wouldn't normally use in the box, I'll try to find a time to use it. I've been using Le Tan and Model Co tanning products, but never tried wash-off. This box was an absolutely winner, I absolutely loved it!!! I was thoroughly impressed with LHI's September box, this one blew my mind! I feel that blue is rather incompatible with olive skin, it's one of those colours I can never really pull off. However, my make up kit is some how overloaded with random blue eye colours... time to put them to good use! I think the key with this look is to blend the crap out of the blue so it looks like it merges into the mid section of your lashes. I find this look quite wearable. I finally have enough used products to post up an empties. I literally use my makeup and skincare at snail pace. I'll probably wait till next year for my next lot of empties! 6. Emergin C Earth Hydrating Phytelene Cream - This was quite nice for my dry skin. The cheapie cream rubs off my face after application. 7 and 8 (oops i wrote 9). Biore combination skin balancing cleanser - This dried the crap out of my skin. It made an alright body wash though. 9. Dissolving Whitening Strips - First time I used it, I didn't know I had to take the strips out after a while... I took for granted that dissolving strips are meant to dissolve in your mouth. Big mistake. It took me 15 minutes to remove all traces of dissolved goo from my teeth and gum. I used it correctly the second time. No real difference noticed. Don't forget to enter my free meal giveaway - c'mon, guys, free meal within Australia! 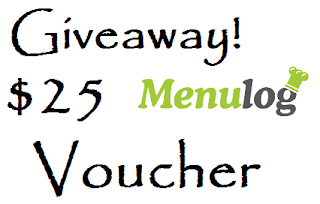 GIVEAWAY: $25 Menulog Voucher - Free Dinner Meal! 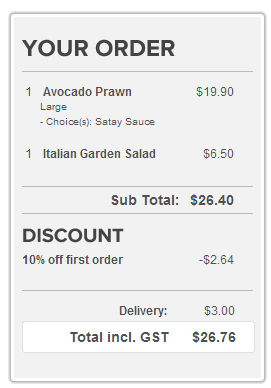 I reviewed Menulog (www.menulog.com.au), an innovative site to order takeaway (in or outside your local area) online! Click below to see what I ordered! Enter for your chance to win $25 - equivalent to a free dinner - to spend on Menulog (you can use this voucher in any participating restaurants or takeaway joints that take vouchers on Menulog). WINNER for Paul Brown Argan Oil! CONGRATS ^_^ I have emailed you! I wear boring taupe and browns Mon-Fri, so I thought I'd wear different colours every weekend. A very simple look. Please excuse my wild fire brows - I've been very lazy. Menulog (www.menulog.com.au) emailed me a few days ago to check out their website. To be honest, I was REALLY excited, this is the first time a food-related company made contact with me. I am all about trying new food and finding new ways to discover food. I had a browse and was intrigued. It's literally an interface where multiple restaurants and takeaway food stores can advertise their delivery and order services to selected areas of Australia. Menulog provides advantages for businesses to further reach consumers and in return, it gives consumers a wider variety of order and delivery options. The major delivery food chains have for some time, monopolized the food delivery market - this has taken away the survival of small businesses. Therefore, Menulog is fantastic for supporting local businesses and provide us with more options. I can sit at home, browse through a list of the restaurants available, look at their menu options and place an order for pick-up or delivery. 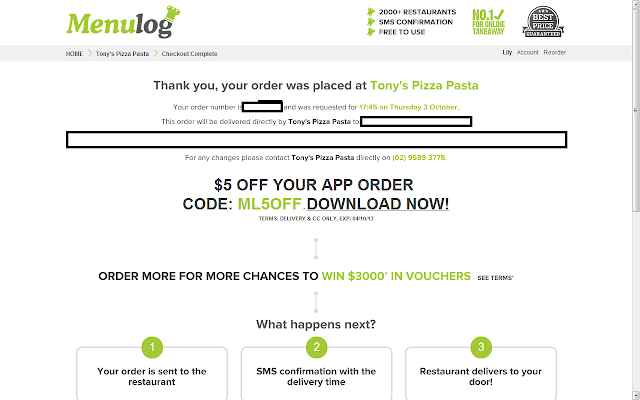 Menulog was kind enough to throw in a voucher, and I decided to go with Tony's Pizza Pasta - a family run business. My partner and I had a browse and decided to go with a large Avocado Prawn pizza ($19.90) and Italian Garden Salad ($6.50). I also received a loyalty credit of $2.93, the amount collates after each order. The total amount can be used after my 9th order. After I checked out, I received a confirmation screen. It was SO easy to use, I didn't need to fill in a long sign up form. It's a great instant order site, if you are unable too get to the shops or just too tired to cook, this is perfect. Our meal arrived pipping hot in about 35 minutes. During that time, I was about to get my house cleaned and hair washed. Mushroom, Onion, Avocado, Capsicum, Prawns, Bocconcini, Cheese, Garlic with satay sauce. It was delicious! I love avocados, but never thought they'd be nice on pizza. Tomatoes, capsicum, olives, mushroom, lettuce, balsamic and olive oil. We heated up some home made garlic bread, dished up our pizza/salad and put on a nice flick to enjoy our evening! I would recommend everyone to have Menulog saved as their favourites! Just in case you get a I-can't-be-bothered-lets-get-takeaway-but-I'm-too-tired-to-walk-or-make-a-phone-call-night, you can order takeaway online! This is also a great way to find and support local business. Where did September go?! Well, I've got these food pictures to remind me! I haven't been eating out too much, so I'll start off with some home made food. Below was our first attempt at cooking salmon from scratch with our own made up recipe, surprised that it actually turned out really nice. 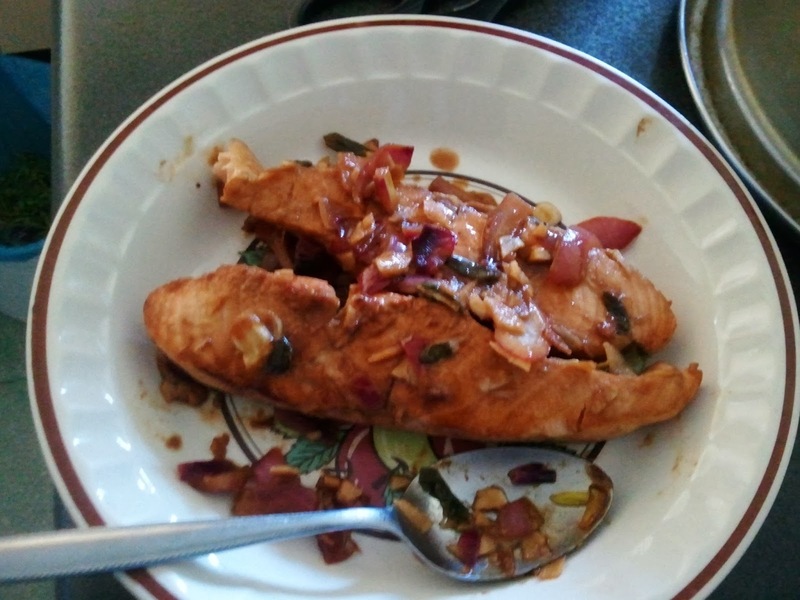 I'll call it Lily's Marinated Salmon :P I'll put up the recipe up later. It was delicious, all gooey in the center. Alright, now the restaurant/takeaway foods! 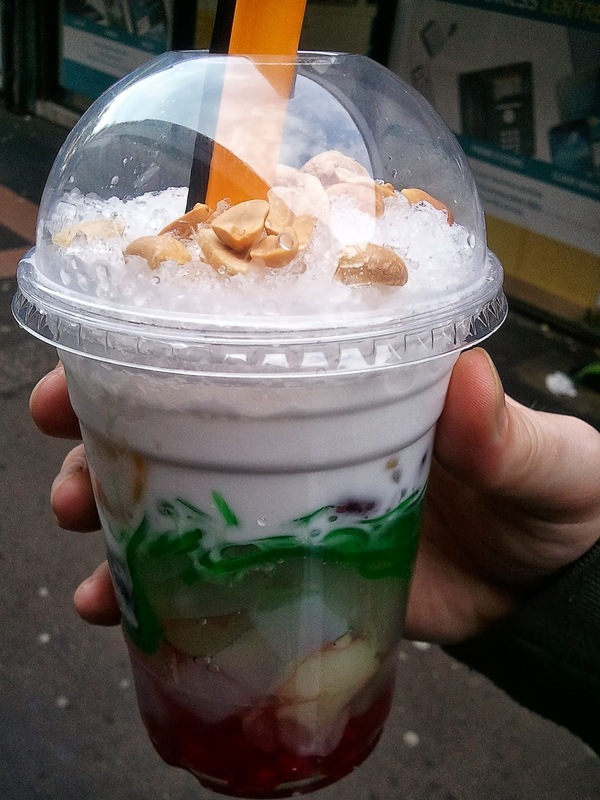 This is a Vietnamese Che, a drink we got from Cabramatta (they had a moon festival - lots of stalls, big crowds). 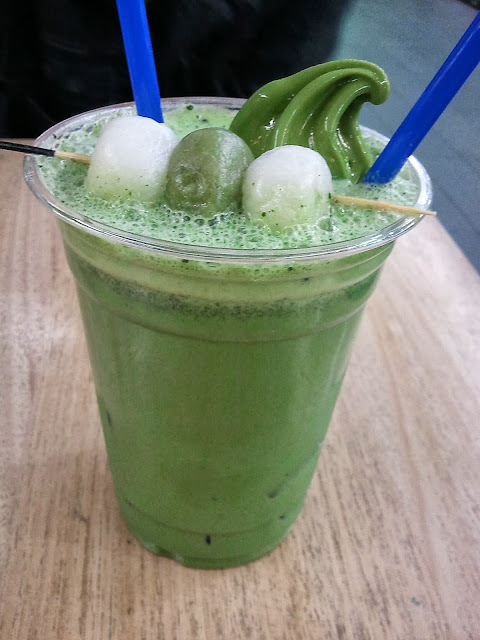 I've never had anything like this, the variety of ingredients in this drink caught my eyes. There were some red bean, coconut milk, the transparent square things are lychee cubes, green stuff is pandan jelly, not sure what the yellow stringy things were.... I think the little red things down the bottom are preserved fruits. Topped off with shaved ice and PEANUTS!.... I know, right?! The peanuts were the best part of the drink. It was nice, but verrrry sweet. We couldn't finish it all. Chanoma Cafe is our go-to place (See Previous Review). The little mochi balls were nice and chewy. One of my favourite drinks! 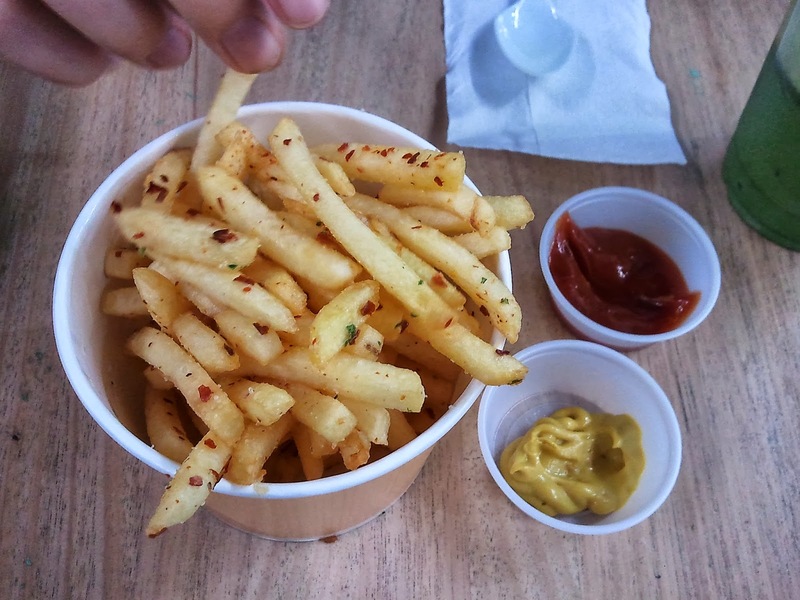 They have awesome flavoured chips - we got garlic and chilli chips. Quite spicy. I eat quite a bit of Japanese food. 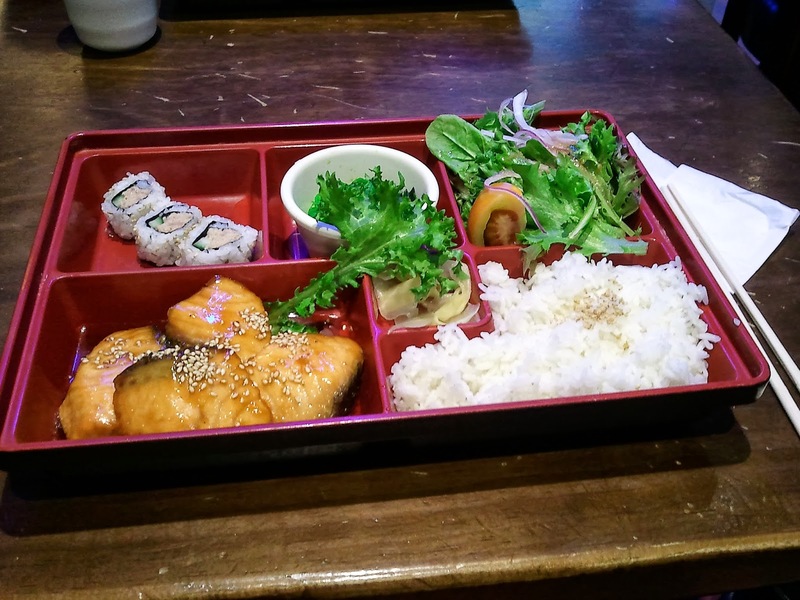 I appreciate the artistry in the bento boxes and sushi. Bento is an all time favourite; variety in one meal! Good Japanese restaurants always have well-cooked rice. If you can't cook a staple well, the whole dish kinda falls a part, especially when it comes to sushi. 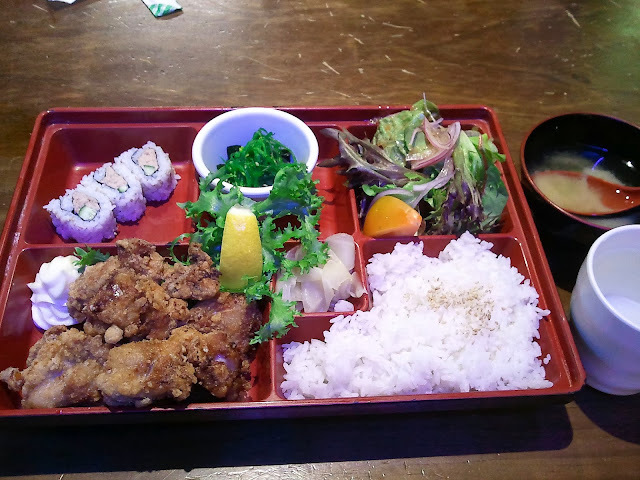 This little gem at Campsie is one of my favourite place to go for lunch time bento. Where are you gonna find a bento like this for $10....???? + bowl of miso soup.